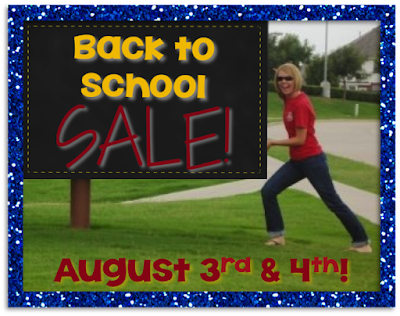 Mrs. Thomas' Teachable Moments: Back to School Giveaway! Yes! You read that right! Back to School, y'all! It's right around the corner for me. We go back with kids on August 24th. When do y'all start? I'm gettin' all ready for Meet the Teacher Night! It's such a fun/hectic evening...that is, until I made an fun/organized way to do it! 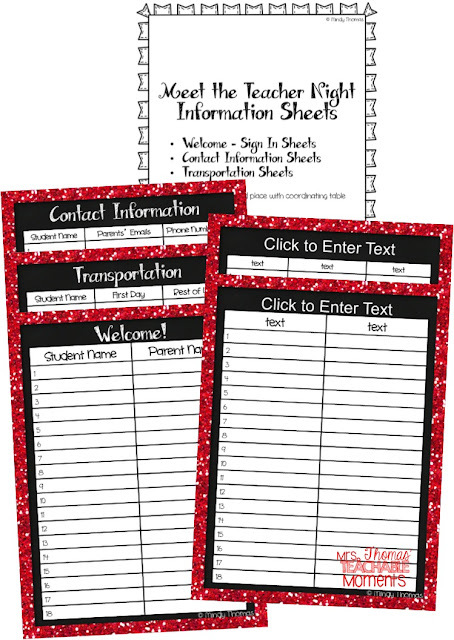 I created a system to get all of the vital information I need, while still being able to interact with parents and create a memorable evening for the families. 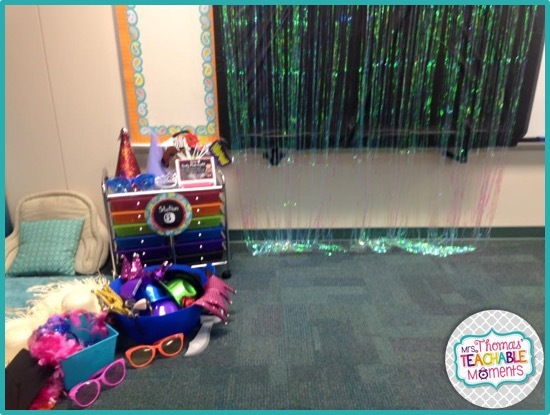 There are seven stations that include things like contact information, transportation, and fun things like a photo booth and a 'Make a Wish' station for the parents to tell me what they hope for their children this year. 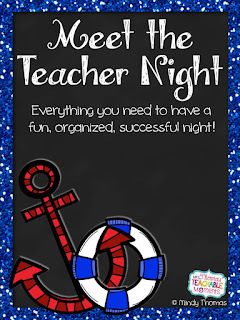 Would you like an awesome Meet the Teacher Night product to help make your night a success? Read this post to find out how! 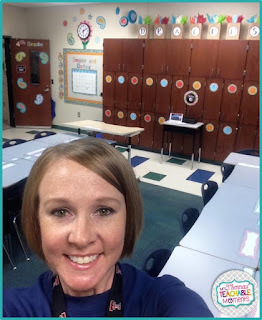 Every year, I try to find a way to have a fun Meet the Teacher Night where I can collect ALL of the important information from parents I need, and still make sure I greet everyone and give them equal time to chat with me about their kids. So, last year, I came up with an idea. I got to thinking, how do I make sure I see my kids everyday during instruction? Centers! 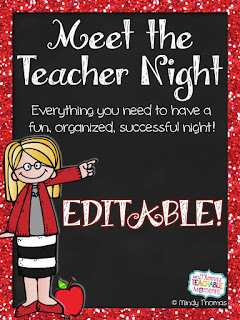 Why not transfer that into my Meet the Teacher Night? I decided that I could make a little poem that could guide my parents and their children through a few centers that would take them through all of the things I need to make sure and get them to do before they leave! (This year, I made an editable version in case you'd like to do this system, but have different needs than what I have listed in my centers). 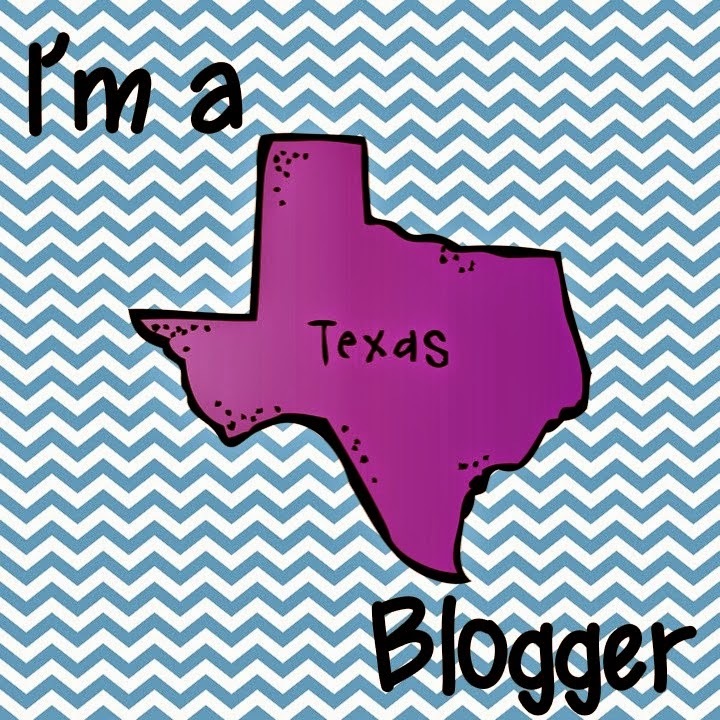 Unfortunately, last year, I wasn't a blogger, nor a seller on TeachersPayTeachers, so I didn't take many pictures of how fun and cute it was! (Bummer!!) BUT - I can at least show you what I used, and I promise to take pictures next year! Here is a photo a buyer sent me! 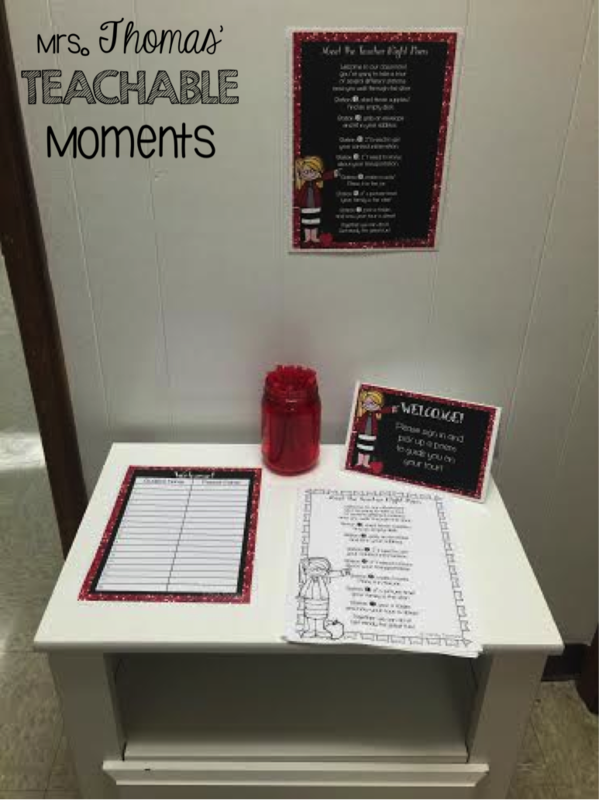 After parents sign in (on a sheet also included), they pick up a poem. This is their guide through each center. Also included, is every form/item you will need if you use the poem as I wrote it. These forms are editable versions if you'd like to change them up a bit. I wanted the locations of the stations to be obvious to the parents and kids, so I printed out these cute tags and hung them around the room. 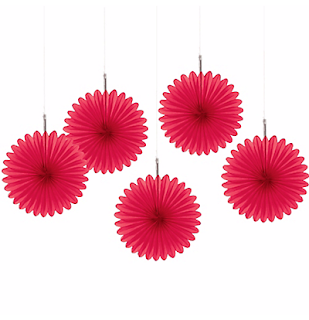 (You can hang them from the ceiling, tape to the wall, or put on a dowel rod like shown in the picture at the top of the post). Cute station signs to hang in designated areas. 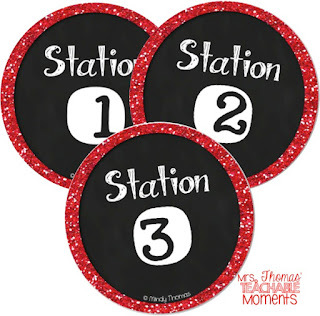 The station signs are SUPER cute and add lots of color if you glue them to the center of paper fans like these! You can get these in any color at Party City for a whopping $2.00! Click the picture to be taken there! Fans from Party City - Glue station signs to the middle of them and hang! 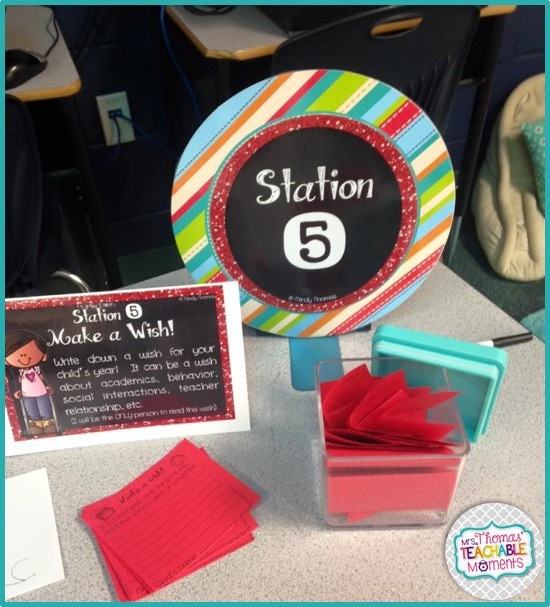 Then, at each station, is a table topper like these that tell the parents exactly what to do! 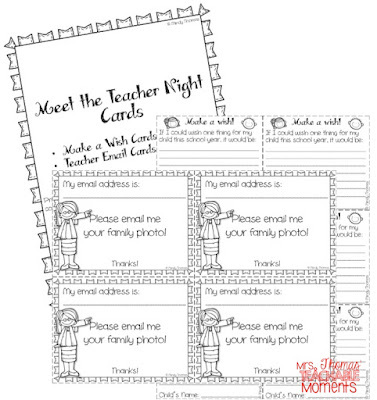 I have included a ready to print version as well as editable versions. I have 7 stations in total, but you could certainly do more or less! 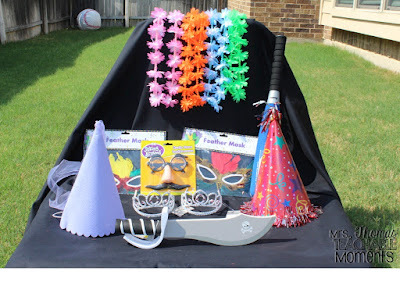 As many of you do, I have already hit up the local Dollar Tree and Target Dollar Spot searching for fun photo booth props. BUT - I included a LOT of printable ones in the packet, so you don't NEED to buy any at all! Here's my loot, though! I have two other versions of this product as well. Click each picture to be taken to a preview of these as well! 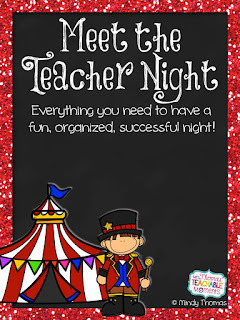 I'd love to see what you all do for Meet the Teacher Night! Please leave comments telling me how you entertain your parents and kids while gathering all of the important information you need to obtain that night. 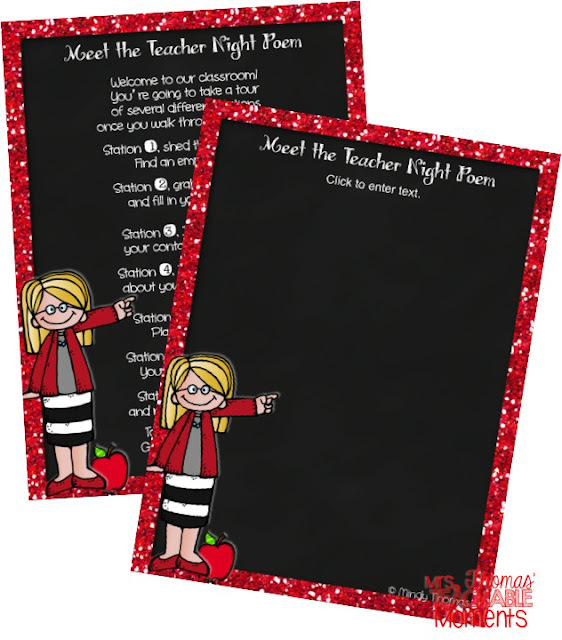 I'd love to give this item away for you to use on YOUR Meet the Teacher Night! 1. Go to my TeachersPayTeachers store and follow me by clicking the green star! 2. Under my "Ask a Question" tab on TPT, comment with what number follower you are. 3. Go to my Facebook page, like, share, and tag 2 friends in my GIVEAWAY post. I'll choose a winner on Thursday, August 6th, 2015. All entries are due Thursday, August 6th, 2015 by 11:59 CST. Giveaways are the popular way of involving students into academic life in our college, by the way! You know, sometimes students should to get distracted and understand that there are ways to find inspiration! I often help in organization of different events for students. Of course it requires time and it influences my academic success. But I try to find ways to help me cope with packs of home assignments. For instance,when I have problems with college papers, I apply to the best British writers and order affordable essays there. I also order different types of speeches and other types of writing assignments. It's very convinient and reasonable. Why not?